Definitely one for the serious experimentalist rather than the 'everyday' user, Bitcom is bloody bonkers. Interesting concept. Genuinely different sound. Sequencer enables rhythmic effects. Built-in synth with MIDI control. Presets don't help much. Difficult to get usable results. No sidechain input for third-party synths. Audio Damage is known for doing things differently, and with its latest plugin, Bitcom, it's taken that admirable philosophical ball and run right out of the park with it. 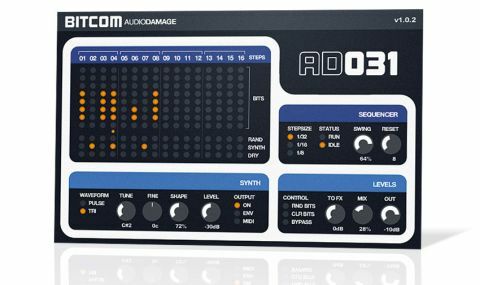 Essentially, Bitcom (VST/AU) is a step-sequenced bitcrusher effect. But while normal bitcrushers let you reduce the number of bits from 16 progressively down to one, Bitcom lets you sequence columns of eight switches, each of which lets you deactivate a pair of bits (16 and 15; 14 and 13; and so on). "If there was a Geneva Convention for the acceptable treatment of audio, Bitcom would be in flagrant violation"
The results are, to say the very least, bold: if there was a Geneva Convention for the acceptable treatment of audio, Bitcom would be in flagrant violation. There's more to it than just the bit switches, though, and that's where things get more creative. First, the step-sequencer comes with a swing function for dialling in as much shuffle as you need. Then, as well as the bit switches themselves, each step plays host to three 'flag' switches, allowing you to randomise the bit switches on that step with every pass, bypass the effect altogether, and trigger playback of Bitcom's built-in synth. Oh yes, there's also a synth that can be blended with the signal. It plays a fixed pitch (set with on-board tuning controls) by default, although you can control it with an external MIDI signal, too. It also features an envelope following mode, which uses the incoming signal to modulate the volume envelope of the synth. Truth be told, the synth is extremely basic (pulse and triangle waves only, with a Shape control that affects both differently), and we'd really like to see a sidechain input for external synths added. As it is, it can thicken sounds up somewhat, but we struggled to make anything other than violently bonkers noises with it (which Audio Damage would probably consider mission accomplished). "The price we pay for such innovation is that not every crazy idea is necessarily as useful as the last"
Finally, the Levels section offers a few additional randomisation controls and dials for setting input gain, output level and dry/wet mix. While you can turn down the output to compensate for the effect making signals louder, there's no output boost facility, so if you turn down the input to control the results of the effect (which you will frequently need to do, as the incoming signal level has a defining effect on the results), you'll need some post-plugin gain in order to bring the level back up. The reason we love Audio Damage plugins so much is that they often take things to the edge in terms of concept, sound and functionality - and long may they continue to do so! The price we pay for such innovation, though, is that not every crazy or ingenious idea is necessarily as useful as the last. While Bitcom will offer lots of highly extreme sonic weirdness and programming fun for some, for most of us, the hectic, ultra-harsh nature of its sound will require an inordinate amount of wrangling to bring it sufficiently under control to fit into a mix. Ultimately, if used with the express intention of mangling your sound in ways that will shred your nerves as much as it will your ones and zeros, Bitcom will most assuredly not let you down; approached from any other direction, though... Well, you have been warned!